I had a great time at ICOTS9. Academic conferences are a bit of a lottery, but ICOTS is two for two for me. 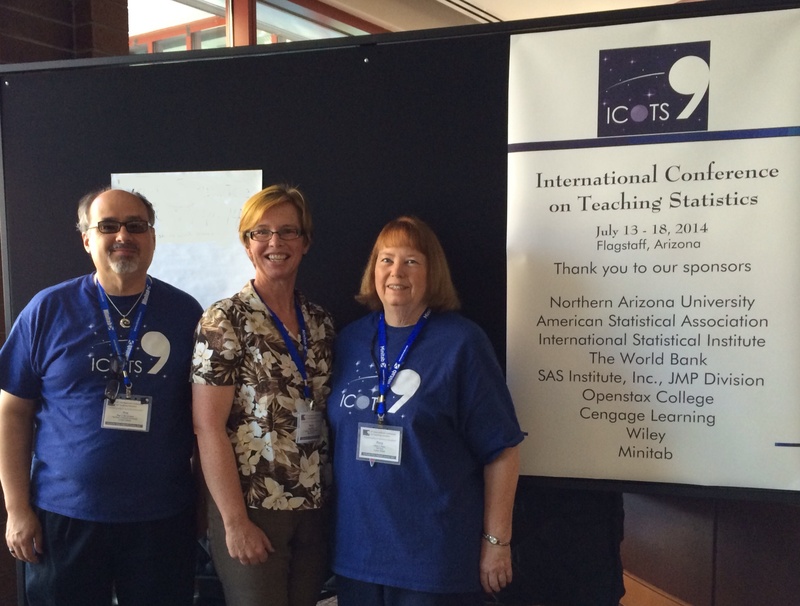 Both ICOTS8 and ICOTS9 were winners – enjoyable, interesting and inspiring. I’ve just returned from ICOTS9 in Flagstaff, Arizona, several kg heavier, with lots of ideas for teaching and our videos, and feeling supported in the work I am doing on this blog, and with our resources and videos. I have met smart, good people who are genuinely trying to make things better in the world, by helping people learn about statistics. Most times when I go to an academic conference, I feel happy if I get to one good, understandable and inspiring session per day. ICOTS conferences are different. I attended every session and just about all of the papers and presentations gave me something to take home. Some aspects of conferences are communal, and some are more individual. The Keynote speakers provide a shared experience to discuss. The keynote speakers at ICOTS9 were all interesting and inspiring, and the highlight was Sir David Spiegelhalter. I’m a bit disappointed I didn’t get a photo with him, but I was hurrying off on the Grand Canyon expedition. (I was going to call it “Dr Nic meets Sir David”!) Monday’s keynote was with Pedro Silva, giving advice on how to maintain “fitness” as a professional statistician. I was impressed at how he saved up his own money to attend conferences and learn things. I am putting into place my own development plan. Then on Tuesday Sir David Spiegelhalter gave us a modified version of what he gives to schoolkids. Bacon and breast-cancer screening provided examples of risk interpretation. He reiterated the necessity of using frequencies rather than probabilities in communicating and working with questions of risk. The highlight for me, which I also tweeted, was Sir David’s statement that “combinatorics has no place in a course on probability.” I also appreciated his analysis of the PISA results, which are given far too much weight, when changes may nearly all be attributable to chance. Wednesday’s keynote speaker, Rachel Fewster, was from New Zealand and gave some great examples of team-based learning at post-secondary level schooling. In fact the course she was talking about was second-year uni, equivalent to Junior year in the USA. I liked the idea of baking dice, and seeing if it changed the probabilities. Her students’ video on sample size effect was particularly engaging. Another idea that appealed to me was to randomly assign students to be spies and agents, and then use their results based on different criteria to detect how many spies and agents there were in each group. I’m sure there are many applications for such an activity. Zalman Usiskin was the keynote on Thursday and discussed the integration of statistics into the whole school curriculum. I was fascinated by his epic effort to count all the numbers in a newspaper. There were 13,518 in the 64 pages of the main six sections of the newspaper. This included interesting problems of definition, which would provide some good discussion in a class activity. And finally, Friday’s keynote address was by Ronald Wasserstein, of the American Statistical Association. He teased us with the promise of a new website to be launched in August, thisisstatistics.org. This site is designed to give students a better idea of the prospects of a career in statistics. He also stressed that the most important skills for statisticians are not technical. We need to be able to communicate, collaborate, plan our career and develop leadership capacity. In the parallel session, for me there were two main themes, which is probably because I chose sessions with these topics! I learned how younger students learn and understand probability, and the use of simulations and bootstrapping in teaching inference. The food, the excursion, the people – all excellent and memorable. I was very excited that the paper I found most inspiring was also chosen for a prize. Christoph Till did some interesting and rigorous experimentation to see how younger students understand ideas of uncertainty and risk, and if an intervention could improve that understanding. You can see the paper here. http://icots.net/9/proceedings/pdfs/ICOTS9_8I3_TILL.pdf One idea that appealed to me, was getting students to come up with their own scenarios around risk and probability. The work by the people at Ludwigsburg is innovative and important and looks like fun. I found out more about AP statistics, and was enticed by the idea of being an AP reader. Tea and toast: Statisticians seem to be obsessed by dropping toast and seeing if the butter side goes down and by a lady who thinks she can detect if the milk was added before or after the tea. Many of the risk examples involve screening for different forms of cancer, and it would be nice if we can move as well to other scenarios such as lie-detectors and recruitment strategies. The Island is still available for use as a teaching tool at RMIT, and we may be able to work with researchers to explore ways in which the virtual world can be used to teach different concepts. We have access to willing subjects, and they have the tools to assess and develop understanding. I met lots of great people, including many who read this blog, and fellow tweeters. Hi! There is a wonderful atmosphere of cooperation at an ICOTS Conference. One thing I was dying to find out, was where the next one will be held. ICOTS10 in 2018 is to be held in Kyoto, Japan. For once I won’t be too far from my time zone. I hope I see many of you there! Big thanks to all the team, led by Roxy Peck and Roy St Laurent. I like a lot your blog, it’s nice and very helpful with new ideas to teach. I am not a statistician (mechanical engineer) and began only 1 year ago to teach statistics to engineering students. Actually they don’t like statistic. As my son told me also his girlfriend hates statistic I began to consider what to do to change this angry with statistics. It was good to meet you, Nic! I’m glad you had a nice time in America. ICOTS is also one of my favorite conferences, along with the IASE satellites, because people are much more collegial than at mega-conferences or events in other fields (maths education). As still a junior member, statistics education supports young researchers much more than other fields I know. This is a VERY good thing.